On October 13, 2014, the small mountainous country of Bhutan convened the National Geospatial Exposition, a historic unveiling of Bhutan’s online GIS data repository. 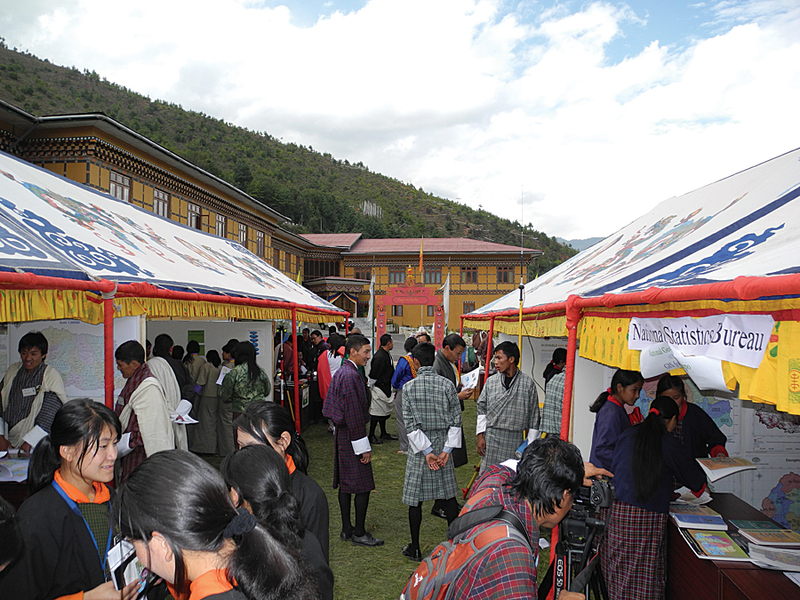 The event included an outdoor display showing the GIS capacity of several ministries; a geospatial competition for secondary school students; and the launching of the Bhutan Geospatial Portal by the lovely 24-year-old queen of Bhutan, Her Majesty the Gyaltsuen. Several international organizations were also present, including representatives from the International Centre for Integrated Mountain Development (ICIMOD), which developed the Bhutan Geospatial Portal with the Bhutan National Land Commission (NLC), and Esri. Thanks to the Esri Education Ambassador program, Dr. Karen Beardsley was also among those present. Beardsley first traveled to Bhutan with her husband and young daughter in late 2013 to visit a Bhutanese friend who works for the Department of Forests and Park Services in the Ministry of Agriculture and Forests. Because they were traveling as personal guests, they weren’t required to pay the normal daily tourist fees. 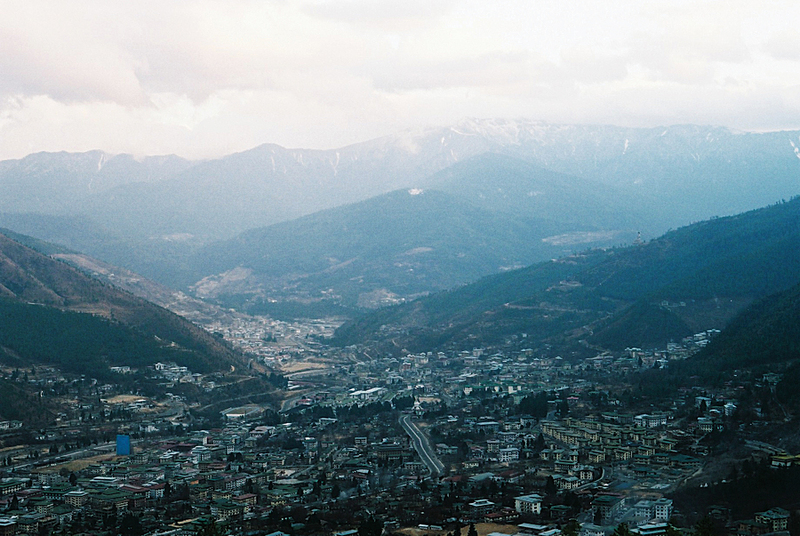 They spent most of their time in and around the capital city of Thimphu, which has a population of approximately 100,000. 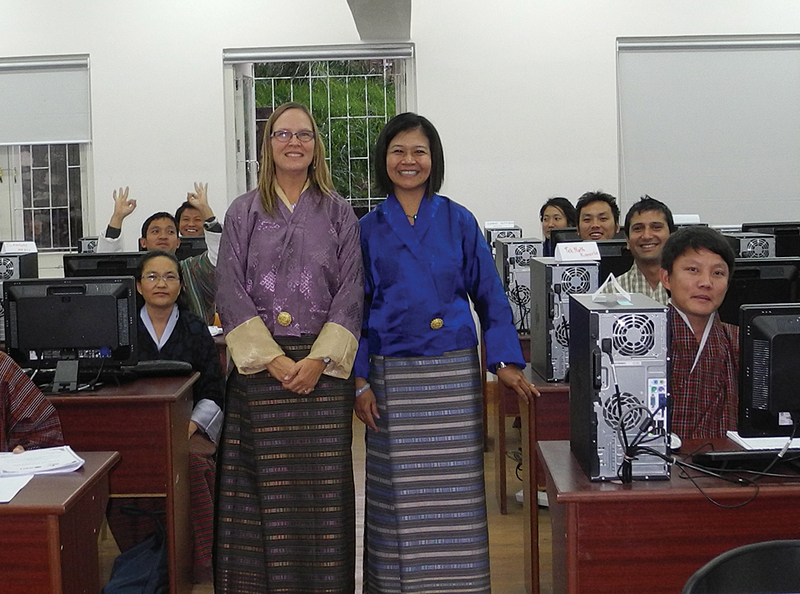 Karen Beardsley and Canserina Kurnia dressed in traditional Bhutanese attire while teaching ArcGIS Online at Royal Thimphu College, Bhutan. About 20 minutes outside of Thimphu, in a serene forested area nestled in the mountains, lies Royal Thimphu College (RTC). 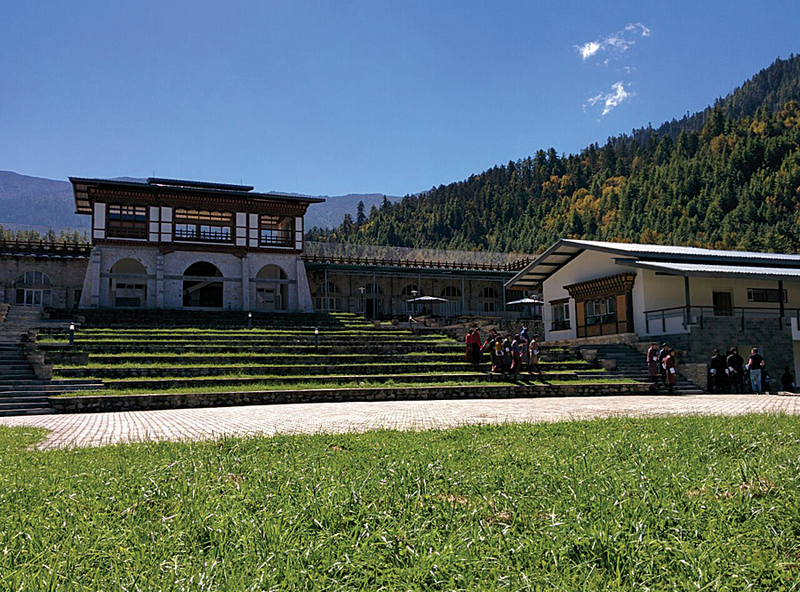 It was the first private college in Bhutan. Established in 2009, RTC offers bachelor’s degrees for students who might not qualify for the relatively few government-sponsored slots at Bhutan’s universities. RTC educators will incorporate GIS training as part of their new bachelor of science degree in environmental management program that will start in fall 2015. RTC’s GIS lab is the best such facility in Bhutan. After returning from Bhutan in January 2014, Beardsley kept in contact with RTC faculty and helped them develop the geospatial science curriculum for the new environmental management degree. By spring, RTC obtained a university site license from Esri. In September, Beardsley helped RTC arrange for the delivery and installation of the software for the GIS lab. RTC needed assistance but, at that time, the local Esri distributor based in India was unavailable. Subsequently, Beardsley was offered an Esri Education Ambassador Award to cover airfare for a two-and-a-half week visit to Bhutan in October 2014. While in Bhutan, she attended the Bhutan National GIS Exposition; helped RTC install and initialize its Esri university site license; and taught two introductory GIS workshops for RTC faculty and staff as well as participants from the government of Bhutan, a nongovernmental organization (NGO), and the private sector. Instructors and participants in the ArcGIS Online course at Royal Thimphu College in Bhutan. M Abdullah Abu Diyan, Karen Beardsley, and Canserina Kurnia are in the front row 7, 8, and 9 positions from the left. The course content for the workshops was donated by Juniper GIS (www.junipergis.com). This content provided just the right mix of technical instruction and project design and development experience. The first workshop was two days long and covered basic skills, beginning with creating and adding data in ArcCatalog and ending by developing a layout to convey results of the analyses performed during the course. The second workshop repeated the course work from the first workshop but included a third day that covered more advanced topics, such as georeferencing an image and editing geodatabase geometry. The workshops, which had a combined attendance of 59 participants, were very well received. The Society for Conservation GIS (SCGIS) provided a grant to cover travel expenses for M Abdullah Abu Diyan, a Juniper GIS certified trainer, who assisted during the workshops. Diyan lives in nearby Dhaka, Bangladesh. He spent 10 days in Bhutan helping set up and prepare the lab and assisting participants with the hands-on portions of the introductory workshops. Following these two workshops, Canserina Kurnia of Esri Global Asia Pacific in Singapore arrived in Bhutan to teach a third workshop at RTC. This workshop on ArcGIS Online was attended by 23 participants from RTC, the government of Bhutan, and NGOs. Bhutan convened the National Geospatial Exposition for the historic unveiling of its online GIS data repository. The GIS workshops held at RTC in October 2014 could not have been successful without the support and dedication of many individuals and organizations. Dr. Samir Patel, associate dean at RTC, worked diligently to prepare the GIS lab and organize all aspects of training at RTC. RTC provided accommodations and transportation for Beardsley, Diyan, and Kurnia during their entire stay in Bhutan as well as supplied tea/coffee breaks, lunches, and other support for trainees and instructors during the workshops. The Esri Education Ambassador program provided Beardsley’s airfare, and Esri covered the cost of printing the laboratory manuals for all RTC GIS workshops. 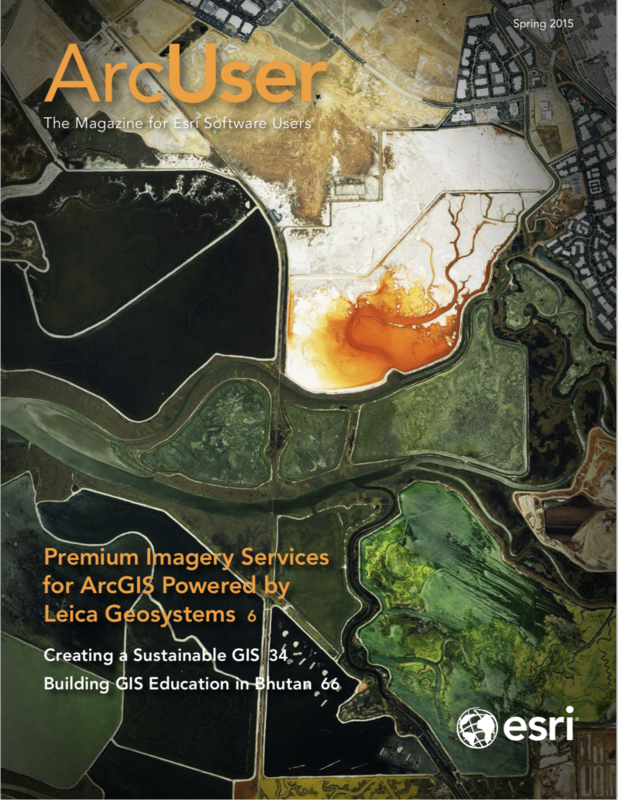 Juniper GIS donated the curriculum and content for the introductory workshops. SCGIS provided funding for Diyan’s participation as an assistant instructor. The NLC secured visas and generously provided transportation, meals, and other support. NLC also hosted the Bhutan National Geospatial Exposition and continues to serve as a key coordinating body for GIS software and technology within Bhutan. In addition to teaching the workshops at RTC, Beardsley and Kurnia worked to build a stronger connection between RTC and the GIS managers and technicians in Thimphu and surrounding areas. Since serving as an Esri Education Ambassador, Beardsley has been awarded a Fulbright Scholarship to teach GIS at Royal Thimphu College. These efforts have gone a long way toward building and supporting a national spatial data infrastructure in Bhutan and building GIS education and technical capacity within Bhutan’s higher education sector. For more information, contact Karen Beardsley, PhD, GISP, managing director of the Information Center for the Environment (ICE), Department of Environmental Science and Policy at the University of California, Davis, at 530-752-5678.